DEFINITIONS: This section presents definitions for some key words and phrases that are generally associated with filtration processes. Particle size in micrometers removed at a given efficiency under a manufacturer?s defined test condition. Also an arbitrary term assigned by a manufacturer. Implied is 100%, but more often defined as 98.67%, 99%, 99.9% and 99.99%, according to the manufacturer. Parker Process Filtration Division defines absolute as 99.98% removal (Beta = 5000) as determined by particle counting methods. The process of a fluid being taken into the pores of a solid. To collect and hold a fluid on the surface of a solid. Procedure upon which Parker tests and rates its filter media; generally a single pass test in water at 2.5 gpm per 10-in length. The ratio of the number of particles of a given size and larger upstream of a filter to the number of particles of the same size and larger downstream. Condition of filter loading where contaminants span the open space between adjacent sections of a filter medium, thus blocking a portion of the useful filtration area. Pressure drop in inches of water required to expel the first steady (continuous) stream of bubbles (fizz point) from a horizontal disc of wetted filter medium or a filter cartridge immersed in a liquid (usually alcohol). Parker Process Filtration Division uses alcohol in its test. A common, nondestructive method used to test the integrity of cartridge construction to compare relative porosities of filter media or to monitor product consistency as a quality control method. Fluid flowing through a passage other than the filter medium and/or leakage around filter media seals. Parker Process Filtration Division style bag which incorporates a spring band bag seal configuration. Designed to fit Parker Process Filtration Division style housings only. Flow rate at which cartridge/bag published performance was generated in laboratory tests. Flow rates above those listed below will adversely affect the efficiency and dirtholding capacity of cartridge or bag. Tendency for contaminant to pass through a low-density area of an inconsistent filter medium or around cartridge seal points. Filtration of liquids containing small quantities of solids. Arrangement or separation of particles by size. Pressure across a filter cartridge or bag great enough to cause it to collapse. Suspension of submicron particles in a continuous fluid medium that will not settle out of the medium. Undesirable insoluble solid or gelatinous particles present in a fluid. The duration, measured in time or volume, that a filter can operate effectively between replacement and/or cleaning. Mass per unit volume of a substance under specified conditions of temperature and pressure. Generally filter media that are thick and provide graded density construction. 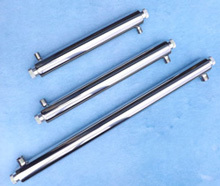 Wound, resin-bonded and melt blown cartridges fall into this category. Typically, these cartridges result in lower flow rates, higher initial pressure drops and lower dirt holding capacities than surface media (pleated). Difference in pressure between two points in a system. In filters, this is usually measured between the inlet and outlet of the filter housing (is a determining factor of filter service life). The weight of a contaminant fed to the filter during a test to reach a predefined terminal pressure drop. A filter cartridge configuration such that both ends are open and require housings with knife edge sealing devices. The ability of the filter medium to remove particles from the fluid stream. The fluid that has passed through the filter. A suspension of small liquid droplets within a second liquid that will not mix. Inorganic or organic elements or compounds in the filter medium that have leached into the filtrate. Usually reported by weight or percent. To be used for filtration of foods, beverages, drugs or cosmetics. All filter construction materials must comply with regulations established by the Food and Drug Administration (FDA) as listed in CFR Title 21. The permeable material used for a filter that separates particles from a fluid passing through it. Separation of particulate matter from a fluid by passing the fluid through a permeable medium that will trap a percentage of the particulates. That fraction of suspended particles retained by the filter. A relationship of flow to surface area; expressed as gallons per minute per square foot. Filter bag provided by Parker Process Filtration Division to fit many competitive vessels (FSI, AF&F, GAF, ISP, etc. ), which is referred to as a snap ring seal configuration. Pressure greater than atmospheric pressure. Compressible or semisolid materials that can pass through filter media at an undefined and inconsistent degree. Best removed by depth medium. Variation in a cartridge that results in the filter medium being more dense toward the core and less dense toward the outside surface. This is useful where a wide range of particle sizes exists because it allows larger particles to be trapped toward the surface and smaller particles toward the core. Amount of contaminant removed by weight as determined by suspended solids analysis (ppm, mg/l). The tendency of a surface to wet with water (water loving). The tendency of a surface not to wet with water (water hating). Incapable of blending or mixing into a single homogeneous phase. Direct impact of particle or liquid upon the filter media. Fluid entering the inlet of a filter. Flow rate at which liquid is in a nonturbulent state (10 ft/ sec) and should not be exceeded to maintain filtration integrity and consistency. Average size of the pores of the filter medium. Material in a filter element that separates solids from fluid. Contamination of the effluent by fibers or other material of which the filter is constructed. A unit of length. Correct term is micrometer (?m), which is .000039 inch. Human eye can see a 40-micrometer diameter particle. A process or system in which fluid is circulated indefinitely through a filter medium, e.g., engines, compressors, hydraulic equipment. Micron size removed at a given efficiency under a manufacturer?s defined test condition. An arbitrary term assigned by a manufacturer. Varies from 50%-98% depending on manufacturer and product. Removal of particles as a function of size as determined by counting individual particles. The property of a filter medium that permits a fluid to pass through under a pressure differential (such as gpm/psi). A measure of the open area of a filter medium. Sometimes expressed as a void volume. A filter cartridge configuration such that one end is sealed off by a closed end cap and the opposite end has a 222 Oring, 226 O-ring or other seal device. Used in housings that are designed to accept 222 O-ring, 226 O-ring or other SOE cartridges. A process in which a fluid passes through the filter medium only once before further processing. Parker Process Filtration products are tested and rated for these types of processes. Ratio of mass of a solid or liquid to the mass of an equal volume of distilled water, or of a gas to an equal volume of air under prescribed temperature and pressure. Filter media that are thin, cellulosic, microfiber or membrane material and, due to their construction, generally provide high flow rate, low pressure drop, high efficiency, high surface area and high dirt-holding capacity. Mixture of solids suspended in a fluid. Expressed in weight or volume. A fluid system where a range of viscosities can be measured at any given shear rate. The longer the material is sheared, the lower the viscosity until a lower limiting value is reached. Total volume of a fluid that passes through a filter before it must be replaced. Measure of the amount of haze or cloudiness caused by fine particles in a fluid. Percentage reduction of haze or cloudiness in a fluid. Flow rate at which laminar flow (10 ft/sec) is exceeded and filtration performance is adversely affected. Having the same weight per unit volume of filter media from the upstream (influent) to the downstream (effluent) side of the filter. Tendency for previously collected contaminant to be forced through the filter medium as pressure is increased. Container for filter cartridges or bags. A measure of the resistance to flow of a liquid. Viscosity of a liquid varies appreciably with changes in temperature. Typically expressed in centipoise, centistoke or SSU values. Pressure surge produced when the linear flow of a noncompressible fluid is rapidly interrupted by devices such as fast-acting valves.